Top o' the morning to you! Did everyone have a fun St. Paddy's Day? I'm ashamed to say that I did not have one single ounce of green beer over the weekend, I must really be getting old! 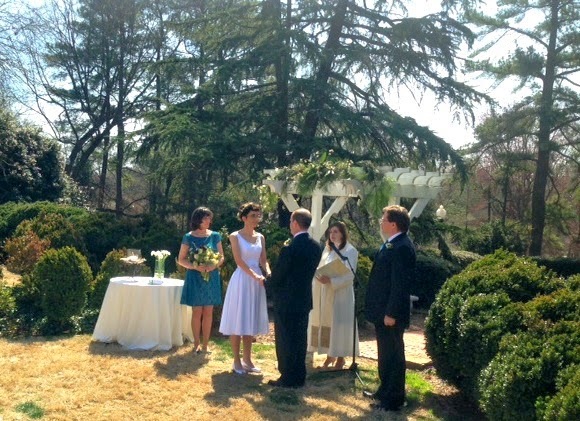 I did however, celebrate St. Paddy's Day by coordinating a lovely wedding on one of the most beautiful days of 2014. Since it's currently 35 degrees, I've been loving re-living this gorgeous day. The bride and groom both have Irish ancestry and therefore embraced the St. Paddy's Day timing of their big day! As I mentioned, the ceremony was held outside. 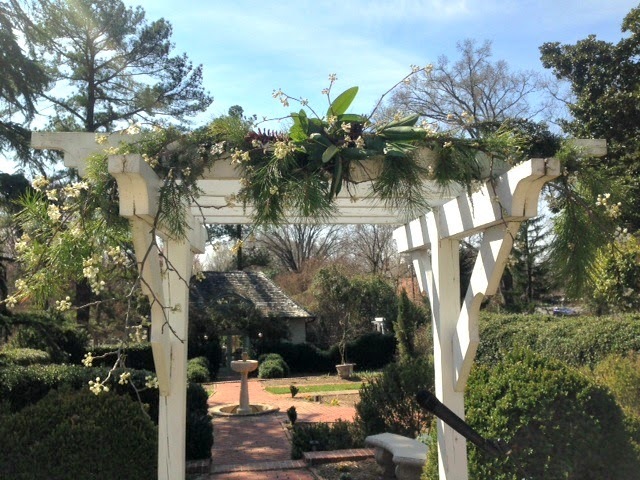 The arbor was decorated with greenery by the creative folks at Commwealth Farms. More on them later! 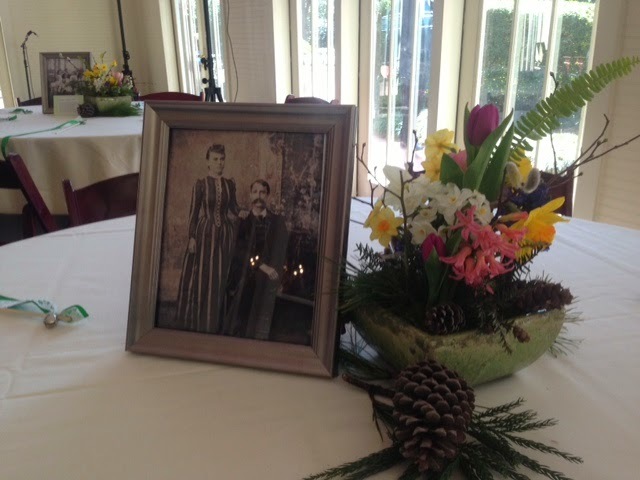 The couple remembered each of their grandparents by having remembrance flowers on the altar table during the ceremony which I thought was very sweet. There was something new for me at the ceremony - a Ring Warming. You can read an official description HERE, but essentially the ring warming is when the wedding bands go around to each guest during the ceremony. The guests can choose to say a prayer over the rings or just put their hands over them and eventually they make their way back up to the minister in time for the exchanging of rings. Needless to say I had to coordinate this which involved me essentially watching the rings like a hawk while they made their way to each person. 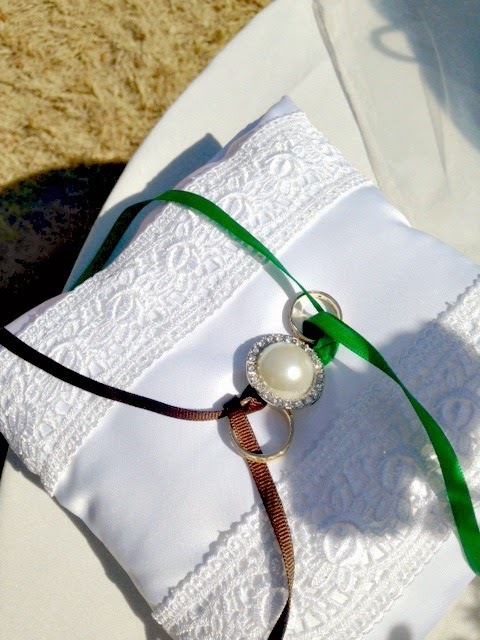 The rings were tied onto a pillow crafted by the bride's mother to ensure they wouldn't get dropped. I'm adding this to my resume - Ring Warming Coordinating! Despite my profuse sweating and running up and down the sides of each row to track the rings location, it was actually really cool. 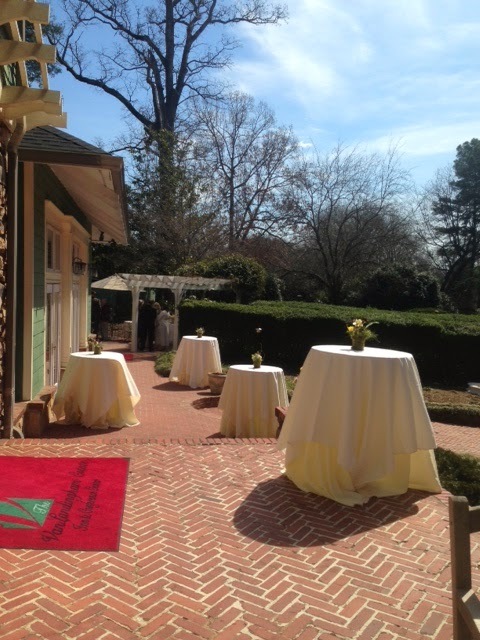 As I mentioned, the VanLandingham has wonderful grounds which made for a lovely cocktail hour. 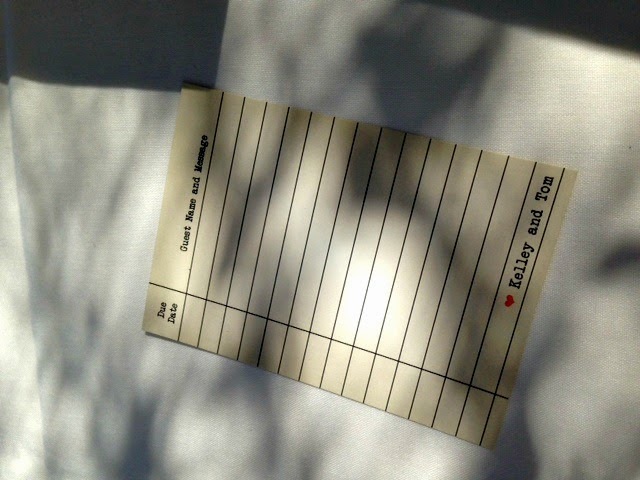 I loved what the bride did for her guest book. Remember how you used to check books out of the library? She order customized book check out cards from Etsy and everyone wrote a note to the couple. The reception was held indoors inside the estate's lovely, light-filled space. I love the stonework on the walls. 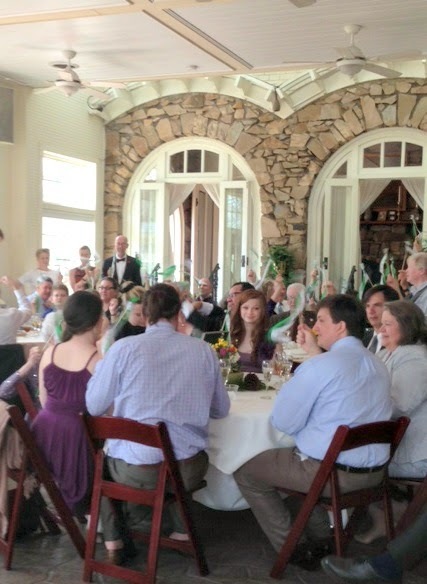 You can see guests in the above photo waving their green and white ribbon wands with bells as the couple is announced. These went perfectly with St. Paddy's Day weekend. 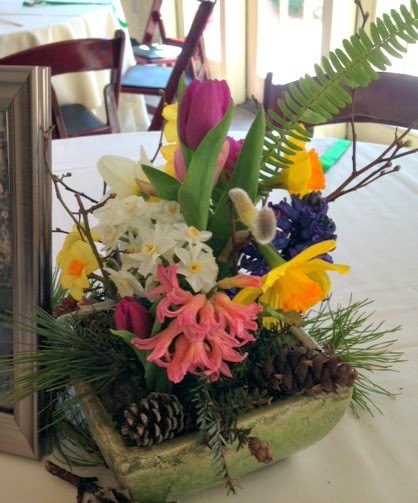 The flowers were done by Commonwealth Farms, who I mentioned above. 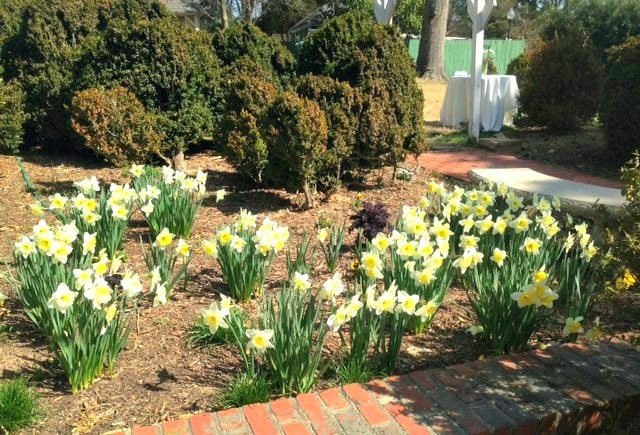 The cool thing about Commonwealth Farms is they grow all their own flowers and use whatever is locally grown to create wedding bouquets and flowers. That means you're getting unique, beautiful arrangements for your wedding day. 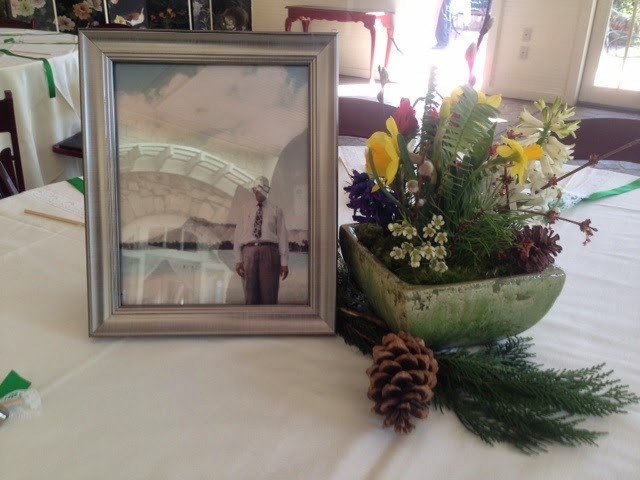 I loved how the arrangements turned out! While the guests were eating in the main reception area, the bride and groom snuck away for a quite moment to eat their lunch in the beautiful Occulus Room on property. 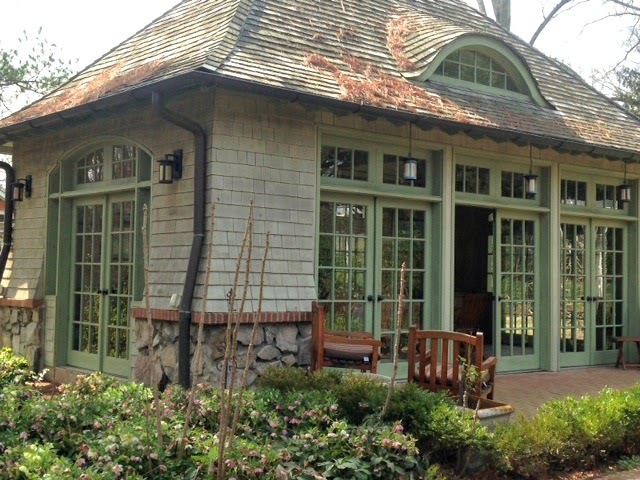 This building is gorgeous and can be rented out for small private events or corporate lunches/dinners. I'm keeping this on my radar for my next baby or bridal shower location! The bride and groom was very much into their families' genealogy and dug up some photos to be displayed on the reception tables with a description of the people in the photograph. It was super interesting and fun for all the family members to read about. 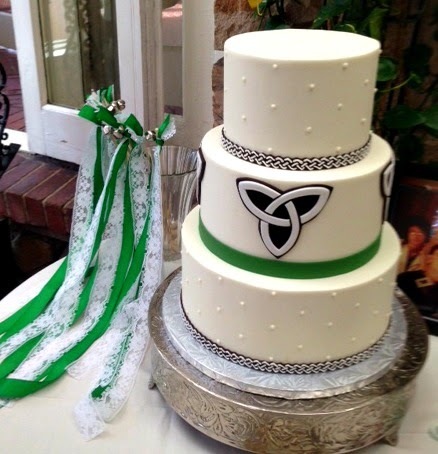 Keeping with the Irish theme, the cake very appropriately had a Celtic Eternity symbol. The cake was created by Daphne's Bakery and they did a great job. 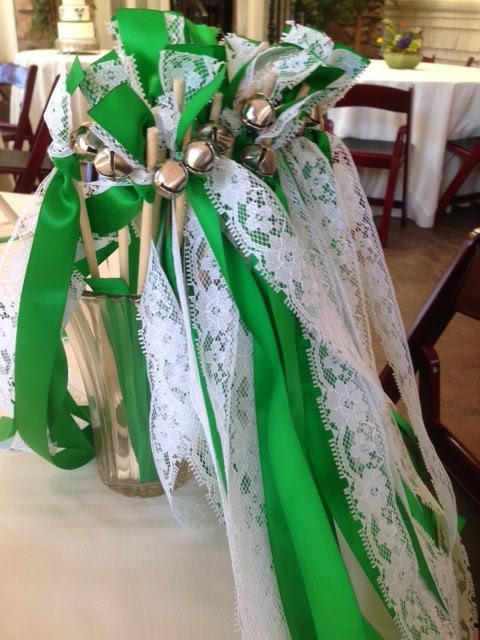 The green ribbon wands were used during the couples getaway as they left the VanLandingham after the reception. 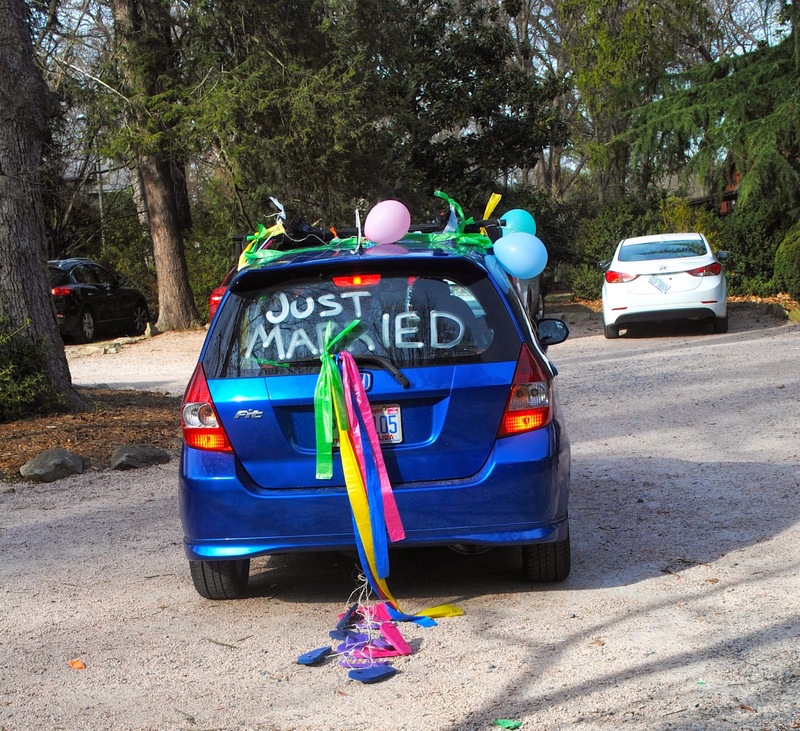 Their friends surprised them and decorated their car (hashtag adorable). 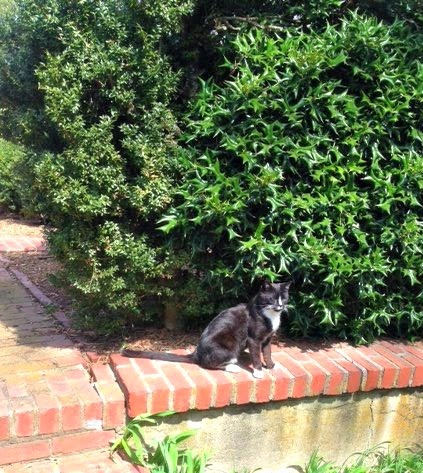 It wouldn't be fair if I didn't mention the VanLandingham's cat Bo, who managed to sneak his way into pictures all day. It was a beautiful day for the couple and I am so happy for them! I should also mention that they had music from the fabulous Marc Hoffman and Irish Dancers from the Walsh Kelley School of Irish Dancing which provided lively entertainment. It was a great way to spend my St. Paddy's Day weekend. I hope you are all having a great week! I like the concept of the beautiful outdoor wedding event. Lovely. I felt like I was there. Congrats again! What a pretty wedding! 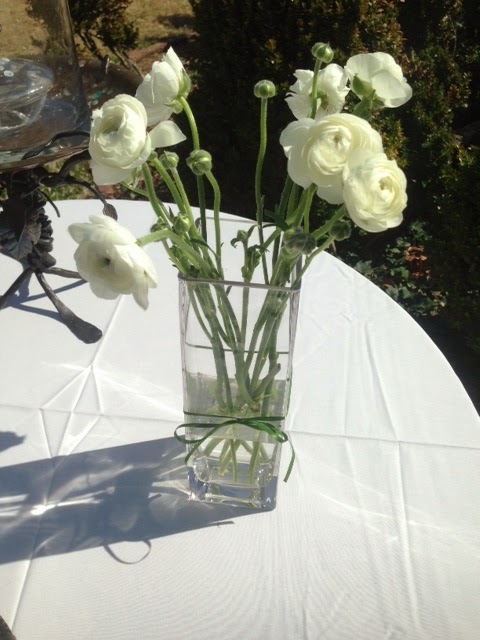 I love the ranunculus and that amazing cake! You did a great job again! lovely wedding and outstanding concept for wedding venue. Bill S here, the matron's husband. You did a great job. Thanks for your hard work. We didn't finalize our menu until a few weeks before the wedding, but honestly, don't worry about it. Many of our guests told us it was the best wedding they'd ever been to! Congrats for the marriage and beginning of new life. The photos are looks beautiful. The blue car looks unique. The style of wedding planing is very nice. I saw many marriages recntly i attend the wedding reception hall Wolverhampton marriage wit my family. The Stargazer lily is a standout amongst the most stunning and striking flowers on the planet! With it's great scent, these sensational lilies will mesmerize your Valentine with valentine flower delivery service! So the first of the Christmas tips is to start your family traditions when the kids are exceptionally youthful and proceed with them consistently. This may incorporate a tree illuminate function where every relative puts a hand-made Christmas improvement on the tree and when all are held tight the tree and before some other decorations are put on the tree illuminate the Christmas lights. A second of the Christmas embellishing tips is to start influencing Christmas to tree decorations early and let every tyke choose their own particular design and their own materials. This could be a discovered small feathered creature's nest that the tyke can load with holy messenger hair and paper silver stars. It can be made from dried shaded fall leaves and sprinkled with sparkle. 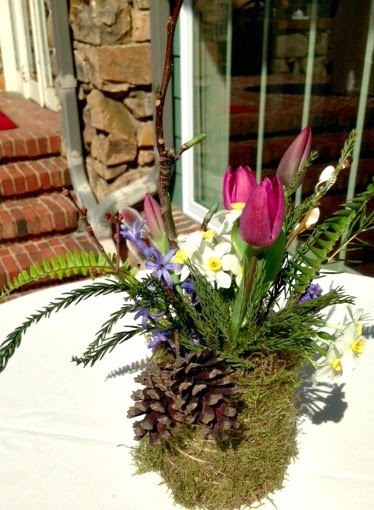 There are numerous ideas like christmas flower delivery and just let the youngsters be as imaginative as they need.